In the book The Hobbit there is a human town named Esgaroth (also called Lake-town) which the dragon Smaug destroys after he is awakened by Bilbo Baggins. 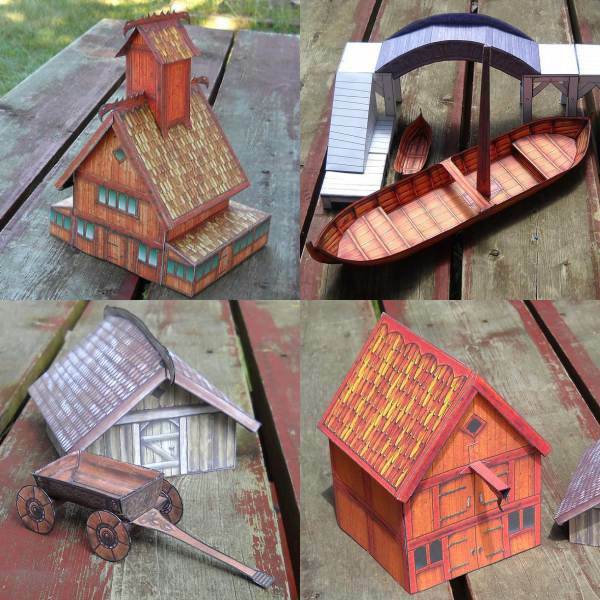 Over the past year Grendels Mother 64 has been creating paper models of Lake-town buildings. The buildings are sized for 25-30mm miniature gaming and include (among other things) houses, boats, a mead hall, a great house, and a dockside warehouse. Templates for the papercraft buildings may be downloaded here. 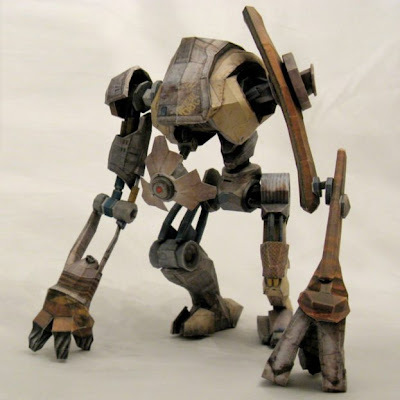 Here's a papercraft Christmas present from Xavier Gale-Sides. It's a model of the character Loki as he appears in the Thor and Avengers movies. In the Marvel Comics universe, Loki is the half-brother of Thor and the Asgardian god of mischief, madness and evil. 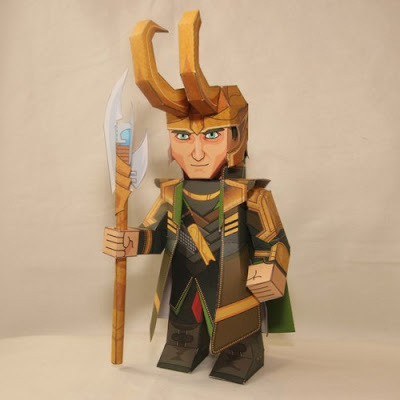 Download the template for Loki and many other Marvel paper toys at Xavier's website here. Here's some great looking Christmas ornaments by Studio Momoki that are incredibly simple to build. 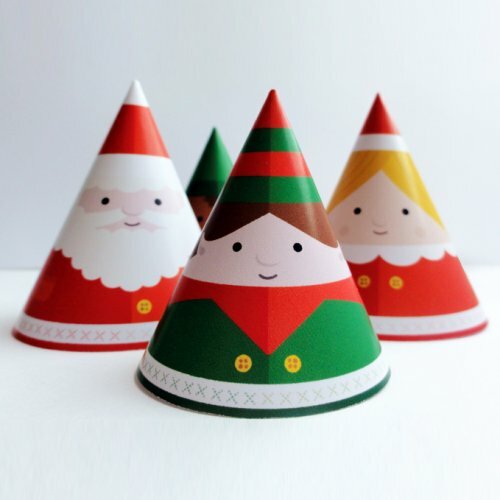 Included in the set are Mr. and Mrs. Claus, an elf, a reindeer, and an angel. 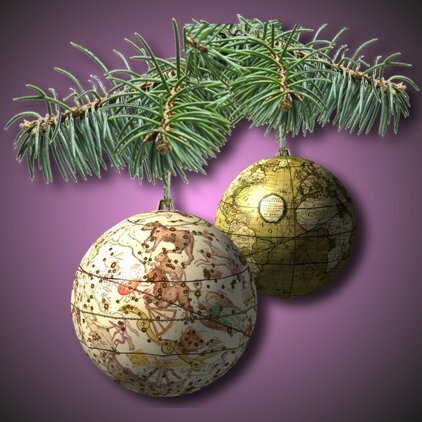 PDF templates for the ornaments are available here. Merry Christmas! The first Apple Inc. personal computer was the Macintosh 128k released in 1984. It had a 9" (23 cm) built-in black and white monitor and came with a keyboard and a mouse. 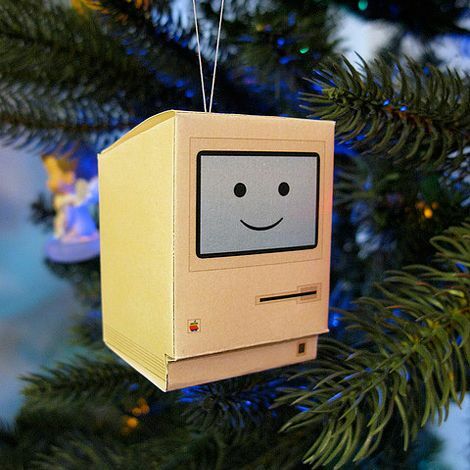 The design of this papercraft Apple Macintosh Christmas ornament is based on the "Happy Mac" icon that was part the start up sequence of Apple computers up until 2002. The papercraft template for the ornament is available here. From the China Paper Model Alliance comes seven Marvel Avengers paper toys. 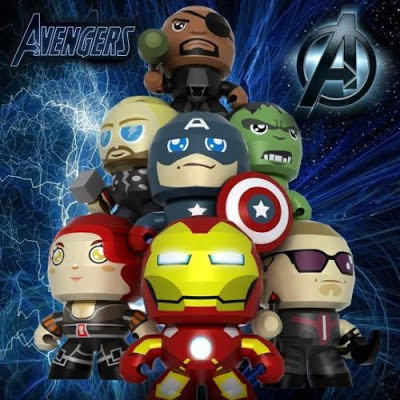 Included in the collection are Nick Fury, Thor, Captain America, Hulk, Black Widow, Iron Man, and Hawkeye. Just before Halloween, as a favor for someone, I created eight papercraft masks based on masks seen in the Payday: The Heist video game. Now I am offering the masks to everyone! The official literature for The Heist describes it as "an action filled first person shooter that lets players take on the role of a hardened career criminal executing intense, dynamic heists in constant pursuit of the next 'big score'". The download for the masks includes A4 and letter size Pepakura PDO files along with eight interchangeable mask textures. 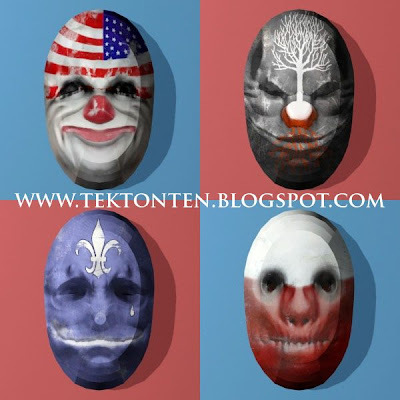 The template for the masks is the same template I used for my Kaonashi mask, Spider-Man mask, and Death Eater masks. Dollar General in cooperation with Coca-Cola is offering two Christmas papercraft projects for the 2012 holiday season. Pictured on top is a pair of 3D paper models of the Coca-Cola polar bears designed by Robert Nava of Disney Experience fame. In the mood for something simpler? 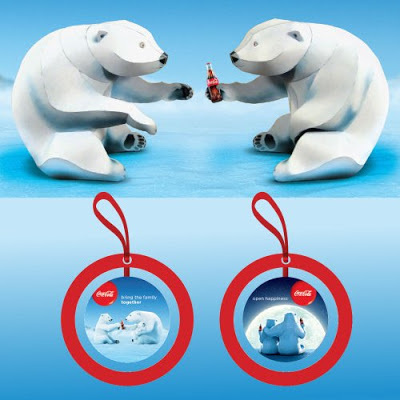 Try a 2D Christmas ornament featuring images of the polar bears. PDF templates for the projects may be downloaded here. 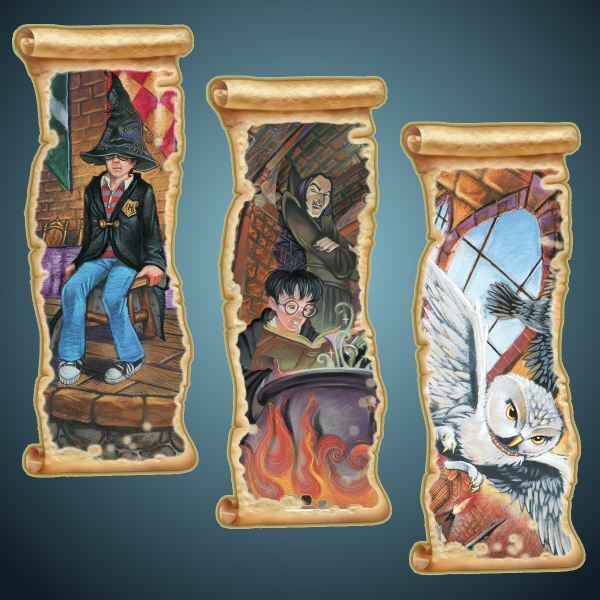 These three double-sided Harry Potter bookmarks were originally offered as a promotional download by Hewlett-Packard. No longer available at HP, the bookmarks live on at The Daily Prophet, a Harry Potter fan site. Pictured in the bookmarks are Harry wearing the sorting hat, Harry in Professor Snape's class, and Hedwig, Harry's owl. Each of the bookmarks is about 7" (17.8 cm) long when printed on A4 size paper. My buddy Elso has created yet another papercraft masterpiece: Scrat! 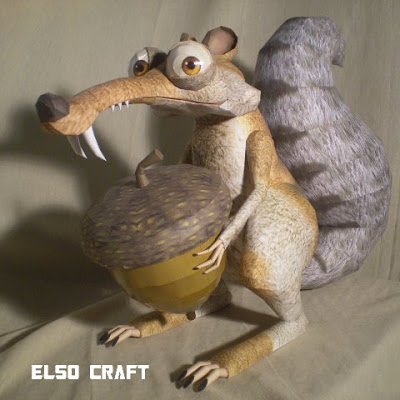 In the Ice Age series of movies, Scrat is the familiar saber-toothed squirrel who is seen continually pursuing an elusive acorn. 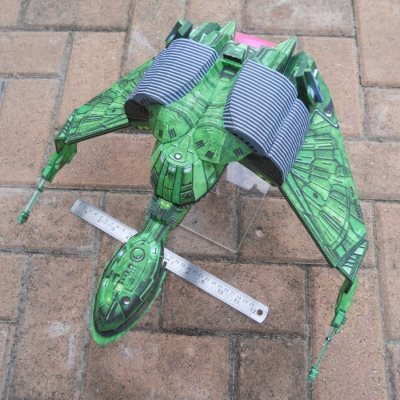 The height of the finished model is 15.75" (40 cm) which I would consider somewhat "larger than life". 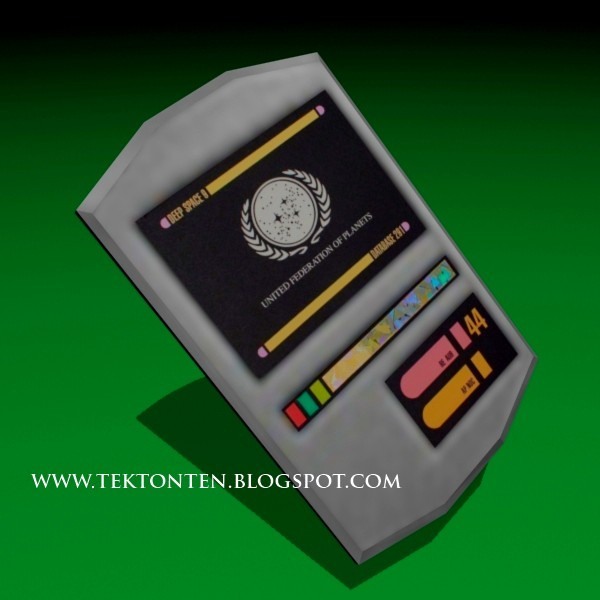 The template is available in Pepakura PDO format only and may be downloaded here. The creativity of origami artists never ceases to amaze me. 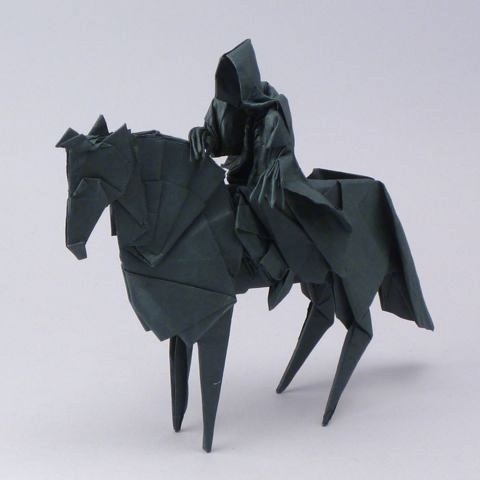 This origami Nazgul (aka Dark Rider, aka Ringwraith) from Tolkien's Lord of the Rings trilogy was created by Jason Ku. The folding pattern for the Nazgul was featured in issue #129 of the origami magazine, Tanteidan. An image of the folding pattern may be viewed here. Not your typical ornaments, Paperpino miniaturized 200 year old globe gores by Italian globe maker Giovanni Maria Cassini to create ornate ball decorations for your Christmas tree. In the foreground is a 1792 globe of the celestial sphere showing star constellations. In the background is Cassini's 1790 globe of the Earth. Each of the balls is about 6" (15 cm) in diameter. The templates for the ornaments are located here. "Dog is a robot, built by Eli Vance to protect his daughter Alyx as a child. Dog's original model was around one meter in height, but as Alyx grew older, she began adding upgrades and new parts to Dog, and he towers around 2.5 meters tall at the time of Half-Life 2." This papercraft model of Dog by Gollum999 is super complex and is recommended for advanced papercrafters only. If you are brave enough to try, ;) the template may be downloaded here.